t/ On the request of Marianne I am posting this little number. As you can see it is a burger made of felt. 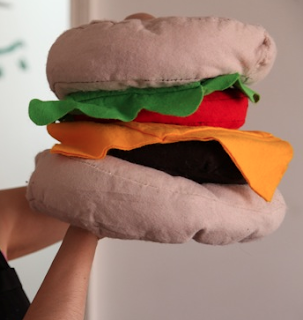 It was a birthday present for my nephew who's nickname is, funnily enough, "Burger". I never intended it to be so big, it just ended up that way. You can pull it apart and put it back together according to your taste - for instance, don't like cheese? Leave it out! There is velcro on all the bits so they stick together. You can't tell from this photo, but there are lots of flaws, as it wasn't exactly measured out and I hand-stitched it. I guess that gives it charm? One day I will learn the sewing machine.